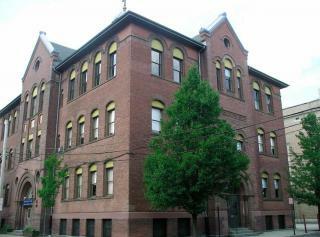 In 1899 this school building was erected on Munn Street for the elementary school originally started in the Church of the Immaculate Conception. It was named Tegakwita Hall in honor of the young Mohawk girl, Kateri Tegakwita, the first Native North American to be beatified by the Catholic Church. The elementary school closed in 1997, and was used by the Immaculate Conception High School, and by Renaissance Middle School, a public magnet middle school. This building is on the State Register of Historic Places.